The Issues: The production of chocolate raises several social and environmental concerns. 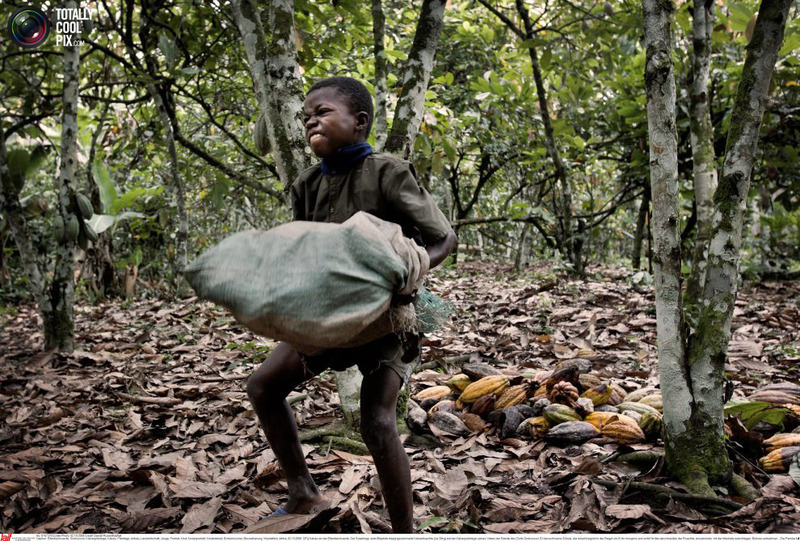 In West Africa, where much of the world’s cocoa is cultivated, slave labor and child labor is well-documented and pervasive – the US State Department estimates that 100,000 children are involved in the trade, and 10,000 of them are victims of human trafficking (aka, slavery). The cultivation of “sun-grown” chocolate often results in the deforestation of rainforests, loss of habitat for wildlife, and the application of pesticides that can be harmful to both human health and the environment. On the other hand, chocolate that is shade-grown beneath the canopies of rainforests can have a positive effect on conservation, as it encourages forest protection and provides a sustainable source of income for communities living in or near these forests. The Options: Numerous campaigns have been initiated to deal with these problems, with the slave and child labor issue gaining the most attention. In 2001, as an alternative to legislation being considered, the largest chocolate companies signed a voluntary protocol aimed at eliminating child labor by 2005. This and a later deadline in 2008 were missed, and the problem continues to be an issue in West Africa, despite the voluntary efforts by the companies. A recent campaign against Hershey’s forced them to make several changes to their strategy, including providing more funding to their efforts to reduce child labor and committing to source 100% of its chocolate for its Bliss chocolate bar from farms certified by the Rainforest Alliance. This new commitment helps Hershey’s catch up with some of the other biggest chocolate companies – Nestle and Mars – but still leaves much to be desired by activist groups. Much less attention has been drawn to the environmental effects of chocolate, but several certifications, including USDA Organic, Fair Trade and Rainforest Alliance, generally claim to be shade-grown. My Decision: Given the scope and severity of the environmental and social concerns associated with chocolate cultivation, I have decided to only purchase chocolate products that have been certified by independent organizations as socially and environmentally responsible (e.g. USDA Organic, Fair Trade, Rainforest Alliance). While no certification is perfect, these certifications increase the probability that the chocolate I consume is shade-grown, organic and not produced by slave or child labor. When I am offered products that have chocolate in them, I will ask the providers of the product where it has come from and whether it has been certified. If it has not been or they do not know, I will try to avoid consuming it, and will inform the provider about the environmental and social problems associated with uncertified chocolate. Given how much I love chocolate and how difficult it is to refuse it when it easily accessible, my immediate goal is to increase my consumption of certified chocolate to 50% of my overall chocolate intake over the next year, and to 90% in the next two years. The World Vision, NWF, and Rainforest Alliance sites below provide a list of companies they recommend as producers of responsible chocolate products. National Wildlife Federation: The National Wildlife Federation (NWF) has a page encouraging people to “purchase sustainable chocolate” to “help migratory birds.” It emphasizes the importance of organic, shade-grown cocoa, and lists six companies you can buy it from – Endangered Species Chocolate, Ithaca Fine Chocolate, Equal Exchange, Shaman Chocolates, Divine Chocolates, and Cocoa Camino (http://www.nwf.org/Global-Warming/Personal-Solutions/Green-Purchasing/Chocolate.aspx). Cornell University: The Mann Library at Cornell University has a useful site that describes shade-grown cacao and the history of chocolate (http://exhibits.mannlib.cornell.edu/chocolate/shadegrown.php). Fair Trade USA: Fair Trade USA has a page describing its Cocoa Program (http://www.fairtradeusa.org/certification/producers/cocoa). Rainforest Alliance: RA provides a list of companies that it certifies: http://www.rainforest-alliance.org/green-living/marketplace. They also have a list of FAQ here: http://www.rainforest-alliance.org/work/agriculture. CNN: As part of its Freedom Project, CNN has been researching and documenting the child and slave labor issue in chocolate. This site has several videos that summarize the issue and provide interviews with Senator Tom Harkin, one of the original sponsors of the Harkin-Engel Protocol of 2003. http://thecnnfreedomproject.blogs.cnn.com/2011/09/19/the-human-cost-of-chocolate/. International Cocoa Organization (ICCO): The International Cocoa Organization (ICCO) has an informative page on the cocoa industry: http://www.icco.org/about/chocolate.aspx and on the environmental effects of intensive cocoa production (http://www.icco.org/faq3.aspx?id=ets1120). I'm an Assistant Professor of Political Science and Environmental Studies at Davidson College.